You are here: Home / Wider Church / Friendship Camp in Sistarovat, Romania. One of our church members, Nicola Thomson travelled with a group of 16 people from Glenrothes Baptist Church to the Friendship Camp in Sistarovat, Romania which was held from the 12th to the 22nd of July this year. evangelism, discipleship training, seminars and workshops, practical work projects, orphanage ministry, education and camp ministries. 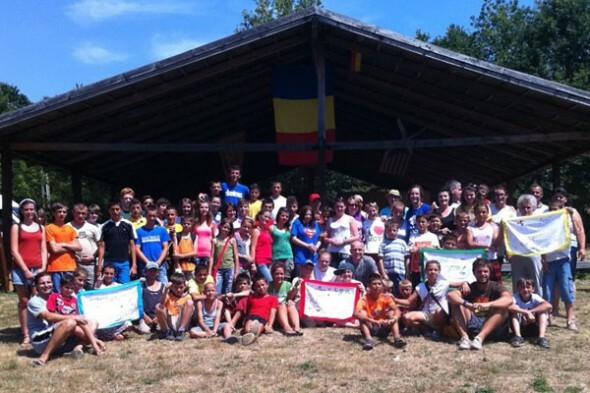 The group ran Friendship Camp where 51 Romanian children attended that week and took part in lots of different activities from making bracelets, watching demonstrations, water games, playing at the park, sports, singing, and sitting round the camp fire. Most importantly the children were attentive and engaging in the teaching of Christianity through multiple teaching sessions throughout the week long camp. It was a fantastic fun filled week for everyone there. Everybody learned a lot and are eager to return to camp soon.